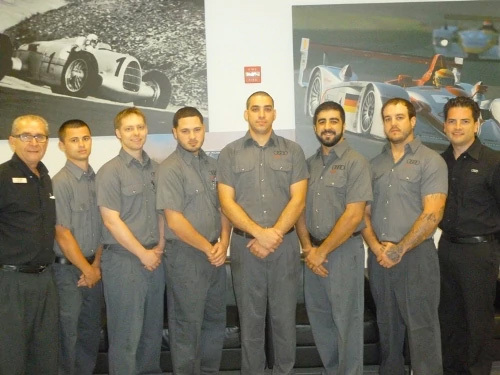 At Audi Pembroke Pines, our highly qualified technicians are here to provide exceptional service in a timely manner. From oil changes to transmission replacements, we are dedicated to maintaining top tier customer service, for both new and pre-owned car buyers! Allow our staff to demonstrate our commitment to excellence. Your Audi is designed to meet and exceed all of your expectations. You can expect the same level of excellence from our service team. Our goal is simple to provide you with a premium level of service so you can enjoy everything your Audi model has to offer. We would like to make your experience as pleasurable as possible here at Audi. To limit wait time, we give you the opportunity to make a reservation for your next visit. If you plan to wait while our technicians work on your vehicle, you can enjoy a delicious Complimentary Continental Breakfast. Along with this added convenience, we also offer a complimentary vehicle wash while we service your car. Additionally, while you wait for your Audi to be serviced, we offer complimentary alternate transportation so you have the opportunity to get more done during your day. For your convenience, the Sixt Rental Company is on premises. Their hours are the same as the service department. Our shop has Master Guild, Master, and Expert technicians as recognized by Audi. With over 30 years of dedicated Audi experience, your vehicle will be serviced right the first time. For your convenience, we offer Ask a Technician to answer any technical questions that you may have. Simply email us your question and we'll get back to you. Your satisfaction is the most important measure of our success. Please take a moment to read about the people, tools and parts that make our dealership exceptional. Then click Schedule Service and experience our excellence firsthand. Come see why our customers all over Broward, Miami Dade and Palm Beach County trust us with all of their service needs. We would like to make your experience as pleasurable as possible here at Audi. To limit wait time, we give you the opportunity to make a reservation for your next visit. If you plan to wait while our technicians work on your vehicle, you can enjoy a delicious Complimentary Continental Breakfast. Along with this added convenience, we also offer a complimentary vehicle wash while we service your car. Additionally, while you wait for your Audi to be serviced, we offer complimentary alternate transportation so you have the opportunity to get more done during your day. For your convenience we have on the premises the Sixt Rental Company. Their hours are the same as the service department. Audi Factory Trained Technicians ? Loaner Vehicles (See Service Advisor for Details) ? Customer Lounge with Wi-Fi ? Earned the 2012 Magna Society Recognition Award ? The Holman Automotive Advantage ?